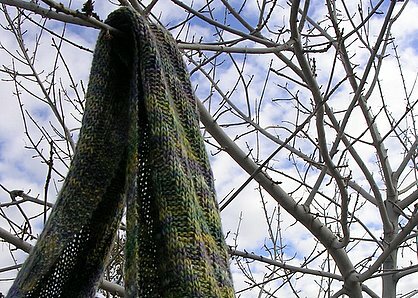 Modifications: Cast on less stitches and used a heavier yarn than the pattern called for. After knitting so many quick and small projects lately, it was nice to work on something more lengthy and substantial. That’s not to say that I wasn’t a bit bored with the pattern by the fifth skein of yarn, but it was still fun, easy, and relaxing knitting. I was able to memorize the pattern after the first repeat, which made it easy to pick up on and off over the last week whenever I had a spare moment to knit. I love that the pattern is totally reversible, so no matter how you wear it it’s the right way! 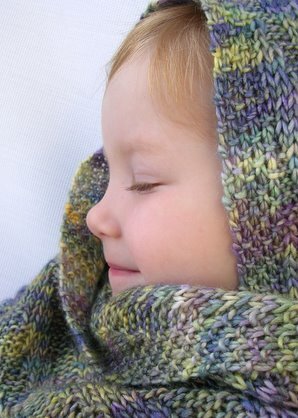 I could see myself knitting this pattern again as a gift or even for myself. 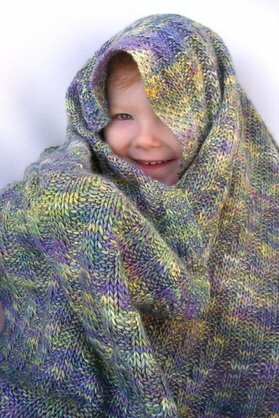 I would probably use a solid tweedy yarn for a totally different look and feel next time around. After washing, the ribbing pattern relaxed considerably and it became more shawl-like as I’d hoped for. I do miss the ripples and texture that was present before washing however I love the drape that it has now. 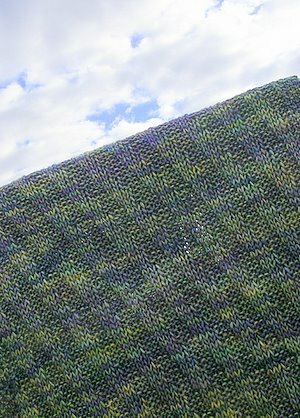 I didn’t do a rigid blocking—just a soak in cool water with Kookaburra Delicate Wool Wash and laid it flat to dry. 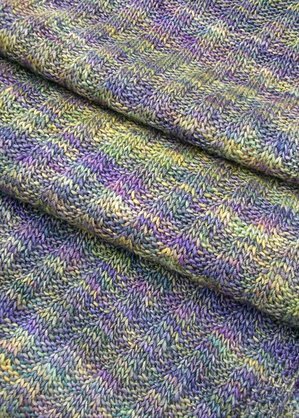 The Silky Merino creates a nice and light shawl, but it doesn’t have the bounce it had prior to washing. Even though it’s extremely soft, I haven’t noticed much fuzziness and there’s no pilling yet—even at the first end I knit that has been carried around with me for days. I will definitely buy this yarn when it becomes more readily available online, though it sounds like there are a few places where you can find it now. Kim bought some from The Yarnery. Right now they have four colors left, and it’s selling for $9.45/skein. Janet said she’s heard that Webs has it, though it’s not on their website so you have to call in to order. Jocelyn also said the shop that she works at, Nine Rubies has some, and you can call the shop for more information. Next time I use this yarn I’ll probably stick to a solid colorway. Each of my skeins seemed more concentrated in certain colors, so with the shawl laid out you can tell where the different skeins were used. I’m not overly concerned with it, luckily my two lighter toned skeins are on the end, and the darker ones are in the middle so it kind of has a cool look. If this were a sweater though, it would be pretty annoying. Since all five skeins were so different I don’t think alternating two balls would even have helped. That aside, there are still lots of things I love about this yarn. There were no odd slubs in the yarn, and it stayed pretty consistent in thickness throughout. There were also NO KNOTS. None, in FIVE skeins. I don’t think that’s happened to me ever! It was so nice! The yarn also splices together easily, so there were very few ends to weave in. Right now I’m in the process of knitting up some swatches with my leftover yarn, so I hope to have a full on review up on our site by the end of the week. P.S. Have you seen these cute mushrooms knit up by Sarah using our Myriads of Mushrooms pattern? They are so cool! She adapted the pattern to make all different varieties of mushrooms. They’re awesome; definitely stop by her blog to check them out.